Get FREE RM 10 Google Play credit when you sign up successfully during the campaign period 22 August - 8 September 2018. You will need to claim it within 60 days. Go to ookyo app > Star Picks > "Free RM10 Google Play Reward" > click 'Purchase'. The amount will automatically be credited into your Google Play Reward wallet. Get another free RM 125 Google Play credit! What is Google Play credit and how to spend it? You'll need to do one-time set up Direct Billing to spend the credit in Google Play Store. 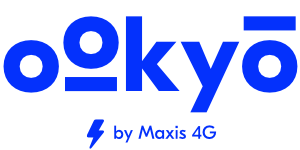 If you're using a dual-SIM phone, please ensure that your call, sms, and data are set to ookyo Maxis network when you're making a purchase using Google Play Reward.